Castedge Mine Manager, Jack Hewitt, pictured in 1922 sitting on one of the coal tubs with his daughter Phyllis. Jack’s wife, Mary stands beside him, with the small mine entrance behind. left: Old OS maps show a ‘Coal Pit’ between Errwood Hall and Castedge Farmhouse. By following the fortunes of his family from the 1840s onward, Kevin was able to bring to life the varying fortunes of a single family over the generations and the way they adapted to changing circumstances. The history covered a century and coincided almost exactly with the life and death of Errwood Hall. The two existed in a close symbiosis for all of that time so Kevin’s talk encompassed life in the Hall and also introduced us to the Grimshaw family. We first meet George, the patriarch of the family, as a boy of 15 in 1841. At the time he is still living with his parents in Kettleshulme where they farmed 46 acres. Ten years later George was married and was a farmer in his own right living at Townfield Farm looking after eight acres. Crucially, as well as a farmer, he also described himself as a coal miner. After another decade he was still farming eight acres but he had another mine at Spons Hill but seems to have been doing well. By 1871 he was describing himself as a coal proprietor and employing 8 men and 8 boys. He was also a brick manufacturer and a local Methodist preacher. Obviously a man of some substance. For ten or fifteen years the family prospered and his sons and eventually grandsons were brought into the business. 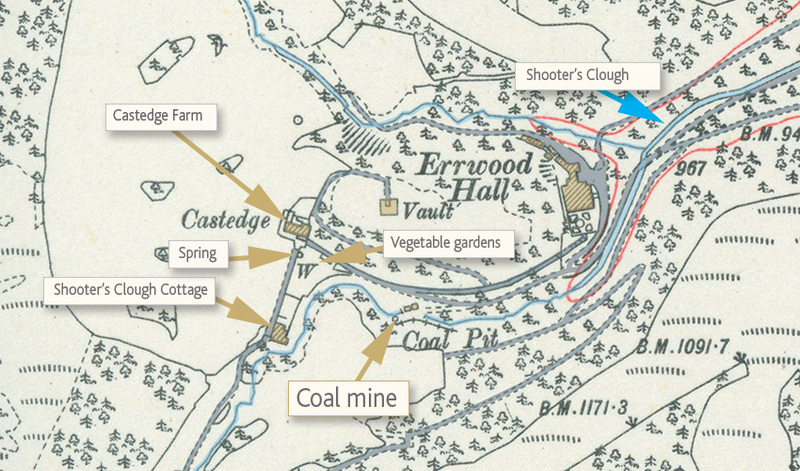 The coal mine was very important, for not only did it supply the Hall, but the whole of the Errwood estate and farms. It was particularly favoured by local blacksmiths as it was a good 'caking' coal for forge work. In fact it was said that people came with their horse and carts from far and wide for the coal, but little money changed hands. They were usually paid in kind, cheese, meat or eggs, or something. The work was hard but rewarding and they were their own bosses. Often they wouldn't start till 10.00am, 'then do a stint'. The huge fireplace at the Hall (right) would take a few hundredweights of coal and when they went they would get a jug of beer, so they always made sure the coal place was well and truly stacked up. At other times, in clement weather, they would relax outside the mine in the warm sunlight. On one such occasion a Mines Inspector visited unannounced and was not too impressed with the casualness with which they regarded their place of work. He insisted upon a number of expensive improvements and safety precautions. Errwood Hall was built for Samuel Grimshawe, a wealthy Manchester cotton magnate. He purchased 2000 acres of the Goyt valley and built the hall in 1841, by all accounts a beautiful old home. It was a double-winged house with a central tower, all standing on a broad terrace looking south. The family planted over 40000 rhododendrons and azaleas, a legacy which still remains today. Many of the shrubs were brought back from tours abroad as ballast for their yacht Marquita. In its heyday in the late nineteenth century, the mine was an unusual attraction for visitors to the hall. When the young gentry came to visit they would ask to visit the mine, and would be pushed in a tub deep inside. Ladies would be given a blanket for additional comfort. The coal mine actually extend ed some 700 or 800 yards into the hillside, being only four feet high at the highest point. At the coal face they would dig out a piece of coal which they would wrap in a handkerchief to show their friends. They would tip ten shillings or a pound for the privilege so they were always eagerly welcomed at the mine. The actual mining was a rather more serious business. It was a drift mine, going horizontally into the hillside, with the main gallery running straight in and laid with simple rails for the trucks. Off this were side galleries, no more than 2’6” high and the coal seam itself was only fifteen inches. The miners would undercut this seam in the afternoon then leave work. Overnight the weight of the earth above the seam would bear down upon the coal and collapse it into the void so the next morning the freshly fallen coal was all ready for loading onto trucks and taken out to the surface. However, nothing could last for ever. By the early 1900s most of the other mines in the area had closed. The Castedge mine survived until September 1933 but it had been given a mortal blow when a flash flood in 1930 badly damaged the mine and destroyed the access road.The coup de grâce was delivered by Stockport Corporation. The last family member to live at The Hall was Mrs Mary Gosselin, granddaughter of Samuel, who died in 1930 and the Hall was emptied of all it's fine art, porcelain and rare furniture in a sale conducted over 5 days in June 1930. It was already known that construction of Fernilee reservoir would begin in 1931-2, so for a short while the Hall became a Youth Hostel, until 1934 when Stockport Corporation purchased all the land in readiness for the construction of Errwood Reservoir. They demolished the Hall, (left: Remains of the Hall today) and used the best stone for the water treatment works, which are situated below the Fernilee Reservoir Dam.The Hewitts lived later at the tea rooms at the bottom of Sandy Lane, still working the coal mine. Joe had a little hut near the Goyt's Bridge and in summertime sold sweets, drinks and ice cream. But it was not the end of the mining tradition. Joe’s son, the fifth generation, earned his qualification as a Deputy and was able to work elsewhere in the coal industry. A fitting end to a century of mining in the Goyt valley.